NOTE: These have now been superseded by the Garmin Oregon 600 devices. The Garmin eTrex GPS was the first device used by Bush Search and Rescue Victoria. Some quick hints for using these follow. To obtain a six figure GR as typically used with maps, simply use the three digits in the middle. In the above example the 6 figure grid reference is 283 189. Press and hold the ENTER button for 2 seconds. This takes you directly to the MARK WAYPOINT page. The screen shows you at your current location. Note or edit the waypoint number. Press the ENTER button to store this location. Press and hold the ENTER button for 2 seconds. This takes you directly to the MARK WAYPOINT page. The screen shows you at your current location. Press the button to move the cursor over the grid reference. Press the ENTER button to edit the current grid reference. Use the up and down buttons to move over each character and press ENTER to begin editing them. Change the characters you need to set the new waypoint. When you have set the new waypoint details, press OK to return to the MARK WAYPOINT page. Take note of or edit the Waypoint Name that appears towards the top of the screen. Press OK to store the new waypoint. Then press the PAGE button to return to the POINTER page. Press the UP DOWN button until Bearing appears. This is the bearing to your desired waypoint. A small “m” after the bearing indicates it is a magnetic bearing. To turn off the unit, press and hold the PWR button for 2 seconds. If you are in a screen you don’t want to be in, simply press the PAGE key until you return to the top-level menu. The PAGE key acts like the Esc key on a standard PC keyboard. For these interesting in obtaining their own copy of the Gamin ETrex Users Manual you can download this PDF manual from Garmin. 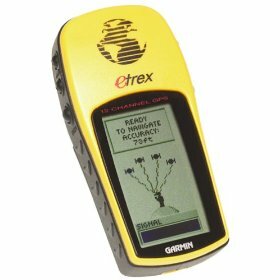 Cables for the Gamin Etrex GPSs can be purchased over the net from the GpsOz web page. The GPS to Data only cable GPSDB9E is $25 or the combo 12v cigarette lighter power to GPS and data cable (GPS3VDB9E) is $59.